My son was asked to bring strawberries to his class Easter party. Our last name is toward the end of the alphabet so I think by the time whoever is deciding what needs to be brought for each party they are desperate for an item to come up with as the cupcakes, paper plates and cups, drinks...the usual items have already been requested so I get random items like "strawberries". What does one do when asked to bring strawberries to a party?! Why make chocolate covered strawberries and of course they need a cute food label to dress them up. These are super simple to make and since strawberries are inexpensive this time of year they only cost $7 to make. 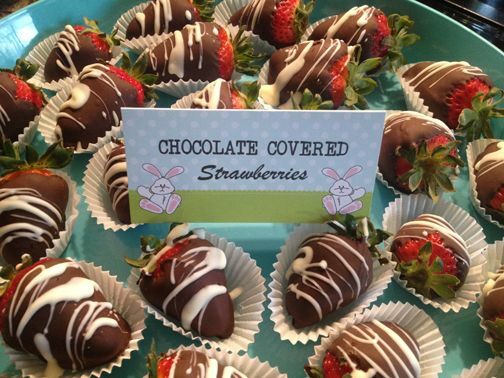 All you need is one large container of strawberries ($4 - this size has 30-35 strawberries), one 12 ounce package of semi-sweet chocolate chips ($2.50) and 2 tablespoons of shortening. Then cook in a double broiler or microwave, dunk and drizzle. It couldn't be any easier or pretty! Also you can buy the pretty blue container which is a larger round platter and has a clear lid for $4 at Walmart. (perfect for transporting and showing off your beautiful strawberries) To help easily serve the individual strawberries I put them in mini cupcake liners. Since I love to make party printables they needed a cute Easter food label to dress them up. If you need a cute food label for your child's classroom party so you can be the mom with the mostest, contact Paper Perfection at jtanddolly@yahoo.com for pricing and details.